Television: This is from the August 15, 2007 program of the weekly music talk show "A&;R Radio". ;The segemnt features Scott Austin, a successful former A&;R rep from Maverick/Warner offering solid music advice, and myself ("P.N.G.") This particualr program was very informative. If you are an artist, or know of someone who is, I would pass this along. Alot of useful information. Sorry, PNG has no blog article yet. Because it is not about who I am in the physical. It is about the music. Let the music define who I am. Let music be my identity. Its all they need to see. The music has become the location for experimentalism and creating material that sounds unlike anything else, both lyrically reflective of the times we live in, as well as having a perceptive and expressive style that is deep, real, and based on these experiences. Since the age of 15, P.N.G. has been more focused on strong content and meaningful conveyance through concepts, both concrete and abstract. Having been influenced by the likes of Pink Floyd, Prince, KRS-1, and Funkadelic. He began his odyssey as a freestyle rapper, deciding to further his expression by being his own band..learning four instruments, developing vocals, and later acquiring an audio engineering background. Over time, PNG became fearless to tackle subjects considered too controversial and sacred to lend an opinion. P.N.G.s 2006 debut EP The Darkest August: Life inside The Myst questioned the current American cultural derision using Hurricane Katrina and 9/11 as the backdrop for its concept, digging further down into the questions of our own humanity as the most affluent nation on the planet. The racism, the violence, the ignorance; this myst he perceived that we are ALL responsible for creating and fostering as a nation: it asks more questions than it answers. Having received good reviews for the EP, but unable to obtain exposure for the six-song EP on a grander scale, P.N.G. decided to establish his own label, ShoEnTeL Music which debuted in June 2007, and began production on Programmed Response, a much more well-rounded and genre-diverse album than the previous. I Am The Air, a very direct, classic rock-sounding tune is currently complete. The song embodies a catharsis between what is elevation in the material world as opposed to what it means in the spiritual. Farewell 2 My Nation, the politically-driven rap track about current controversies, takes a stab at a more sarcastic view of them, yet being very informative at the same time. What the legendary KRS-1 used to call Edu-Tainment. The goal is not just to offer another tired indie product, but sound that truly embraces all genres and styles, beyond hype and commercialism. Its about the music. Its about time. Programmed Response is due early 2008. Now is the sunset of the all-controlling monolithic major label. The digital age has arrived in full, and many artists (including established artists) have found a new indepedent life allowing for more gain in revenue without having to sully about wrestling over royalties, proper payment, and creative freedom. 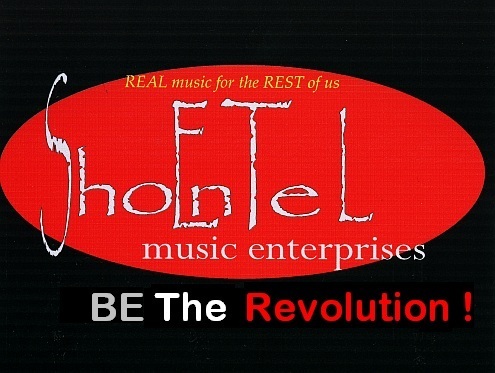 ShoEnTeL Music/SME Publishing sets to be the leaders of the new school: one that allows for profitibilty for its Artists as well as strong revenue stream to stay competive in the New market as a label. As we are still in our infancy, new ventures with other investment groups and management companies are still in process. The goal is to create a model that is reflective of not only the new independant insurgency that has now taken hold, but to also foster a new 'mainstream' that is vibrant , alive, and not riddled and over-indulged in the pervasive commercialism so much popular music is mired in. 'Indie' should not only be defined as just unruly and unpolished, but defined also as a true entertaining medium worthy of fanfare by virtue of its sheer power of talent, aestetics, and message. Though all music falls under the same kind of subjectivity of ; "one mans trash is another mans gold", SME sets to be the one place where those who are fans of such classic bands as 'Floyd, Zepplin, AC/DC, and Kate Bush..funkmasters like Parliment/GeorgeClinton, the Time, Prince..will find our artists a suitable safe haven to enjoy and explore something new. Fans who are more the Madonna/Britany Spears/Ciara/ Beyonce set might discover something more meaningful and deep, hence upgrading their respective collections with our Artists. The mention of the bands doen't mean that this label is 'targeted' at. It's only a minute example of a larger picture. Are goal is to be all-inclusive, with NO compromise in the the elements that make music such an incredible experience: Realness, Soul, Substance, and Relevance. You should stay tuned..as more Artists are added..and more music is put out by P.N.G.. Development and time is the key. As more exposure occurs for us, and as revenue starts to rise..we'll be looking NOT to 'take over', but to lead. ; Lead by example, lead by a strong fanbase, and a plethera of artists who don't deserve to dwell in the dungeon of the underground, coupled by mainstream acts who have real talent, and something to say. We seek alliances with like-minded artists/ labels who wish to take this to another level at this time...are you one of them? Let us know about you. Check us out and communicate. If your in the business in serious way, let us be introduced.